Fri., Nov. 9, 2018, 4 a.m. Although they might seem antiquated, catalogs are still a surprisingly successful marketing tool, according to studies from the Data & Marketing association, which found that more than 100 million American adults made a purchase from a catalog in 2016. 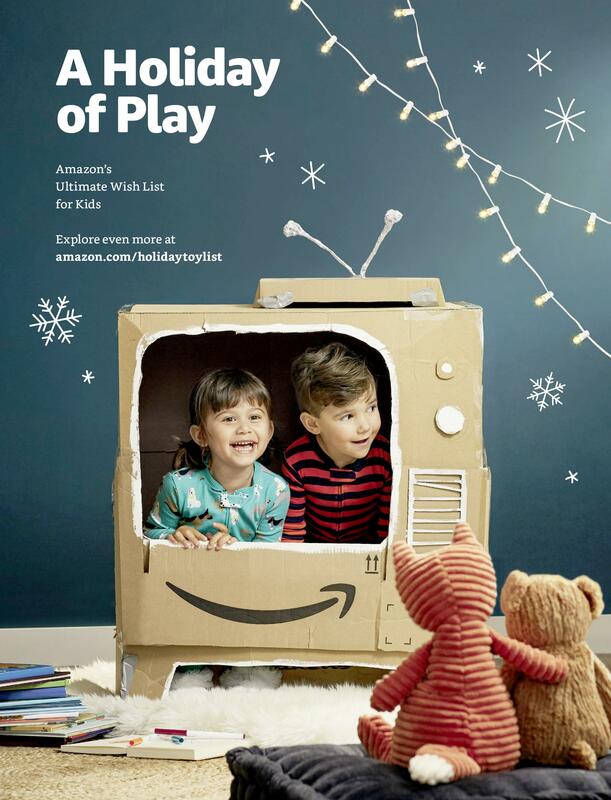 Amazon.com is gambling on glossiness and nostalgia to draw in shoppers with its first toy catalog, in yet another brick-and-mortar strategy to snag its share of the holiday toy sales. The company released its “Holiday of Play” catalog on Wednesday. It features 70 pages of delighted, cozily-clad kids surrounded by toys, and will soon be mailed to millions of customers this month. It showcases the breadth of holiday toy inventory, from classics like action figures, board games and Barbies to high-end items like Bose audio gear and PlayStations. When former juggernaut Toys R Us shuttered its last stores earlier this year, it kicked off a scramble among brick-and-mortar giants such as Walmart, Target and Kohl’s, along with online powerhouses such as Amazon, as all clamored for a piece of the nation’s $3.3 billion toy market. “Amazon is excited to offer a new way for customers to shop for toys this holiday season,” the company said in a statement to The Washington Post. “Holiday of Play” echoes of the familiar style of the Toys R Us holiday catalogs, but with certain modern flourishes. You won’t find any prices on its pages; shoppers have to go online to find out how much the products actually cost. Instead, a scan of a QR code places the item in the shopper’s online cart, taking them from page to purchase in seconds. Digital versions of the catalog are available on Kindle and in PDF form online. The catalog is just one weapon in Amazon’s holiday arsenal, along with its free shipping for all customers during the holidays with no minimum purchase required. The lack of explicit prices in the catalog is intentional, leaving Amazon open to shifting its pricing to stay competitive as the season heats up, said Linda Bolton Weiser, an analyst with D.A. Davidson. Bolton Weiser noted the products in the catalog are culled primarily from the year’s hot toy lists and from stalwart toy brands like Barbie, Fischer Price and Lego. There are no risky, unknown items featured. Although they might seem antiquated, catalogs are still a surprisingly successful marketing tool, according to studies from the Data & Marketing association, which found that more than 100 million American adults made a purchase from a catalog in 2016. They’re especially popular with millennials, who now wield some of the greatest buying power in retail. Other retailers are boasting big changes to show their commitment to holiday toy sales. Walmart beefed up its “Top Rated By Kids” program and is collaborating with a group of 25 “kidinfluencers” to curate a list of the season’s hottest toys. The company is boosting its in-store toy merchandise by 30 percent and online toy merchandise by 40 percent. And it’s also hosting 2000-odd events to promote the new products. Target is expanding, too, nearly doubling its new and exclusive toy lineup compared with last year. It has expanded its toy sections and made remodels in 100 stores. Meanwhile, Toys R Us is still limping along, even past the grave. Last week, the Kroger supermarket chain announced that it would host mini pop-up toy shops, called “Geoffrey’s Toy Box” at nearly 600 Kroger stores in a partnership with Toys R Us during the holidays. Geoffrey the giraffe is the Toys R Us mascot. Published: Nov. 9, 2018, 4 a.m.